The Indian fashion ecommerce marketplace company, Myntra used Truecaller to connect with smartphone users prior to its Blockbuster Sale period, clocking a whooping 2 Lakh+ clicks along with 80 Million Impressions in a single day. Based in India, Myntra is the biggest fashion e-commerce platform in India that serves millions of Indians, with more than 2,000 world’s top fashion brands on the platform. The brand wanted to create high visibility among smartphone users with data connectivity & reach out to them prior to its Blockbuster Sale between 14th-16th July 2017. Founded in 2007, the company is one of the largest online fashion retailers in the country, with over 15 million users. Myntra organises sales events over a limited time period, typically three to five days, with each event featuring either a single brand or a small group of brands. Visitors can access the sales via desktop, mobile web, Android or iPhone apps. As a modern e-retailer, Myntra is embracing mobile as a new way to connect with its customers with the smartphone becoming an inseparable screen for customers. The retailer wanted to gain attention and attract more users and decided to target the smartphone users in india on account of its Blockbuster Sale. 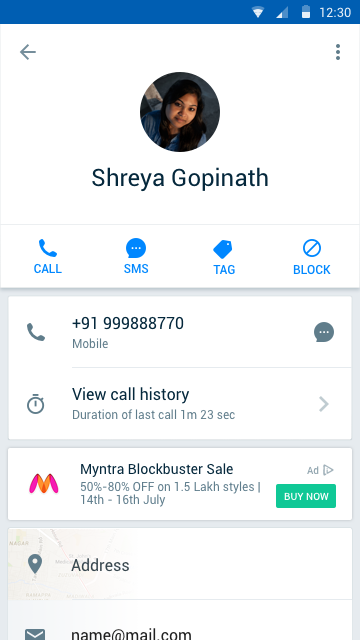 Myntra launched a Truecaller Brand campaign to promote its 3 day long sale. The Indian Fashion e-commerce portal worked with GroupM & Truecaller to run a highly efficient campaign which drove click volume and awareness. 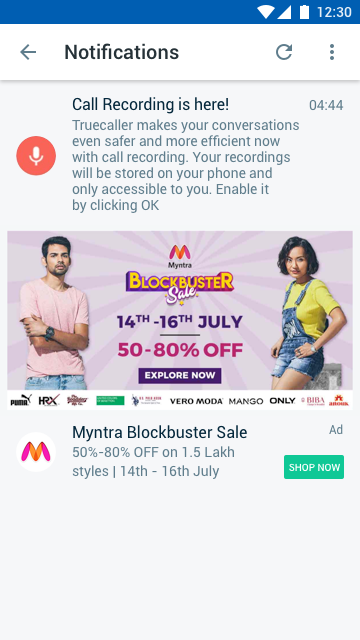 Myntra invested in a Truecaller In-app Native Roadblock to prepare customers for its upcoming sale periods. Breaking its campaign into 3 stages, Myntra used day part targeting to drive sequential messaging. First Stage of this campaign focussed on communication that intended to excite customers about the upcoming sale. The messaging successfully conveyed the brand message & had an Explore Now Call to Action button. For better results, the ads showcased different brands and labels Myntra houses as well. This ad ran from midnight to early afternoon. Second Stage of this campaign began at a strategic time between late afternoon & late evening, when customers were informed that the sale prices would be revealed at 8pm , thereby developing an interest & a level of excitement among them. Each in-app native ad had clear description for the same along with an Explore Now Call to Action Button. The Third & Final Stage of the campaign called out that prices have been revealed for the Blockbuster Sale. This ad also had an "Explore Now" Call to Action button, through which customers were directed to Myntra's website to check for the brands and shop. The In-app Native Roadblock is best suited for delivering a brand's message and driving massive traffic on your website via clicks. This property gives you inventory within the Truecaller App, touted as the Performance Roadblock property. Myntra gained a staggering 2,00,000 + clicks on a single day.